John Legere has accomplished quite a bit in his time as CEO of T-Mobile, and now he’s got another achievement to add to that list. Legere has been voted the most powerful executive in the US telecommunications industry. The voting was hosted by FierceWireless, who has been running a bracket-style tournament over the past week and tallying reader votes to determine the most powerful exec in US telecom. Over the past week, Legere has beat out several other notable executives, including Sprint CEO Marcelo Claure and Dongjin Koh, head of Samsung’s mobile business. In the final round, Legere handily beat Google CEO Larry Page, tallying 6,286 votes compared to Page’s 578 votes. John Legere has made a major impact on the US wireless market since he joined T-Mobile as CEO in 2012. 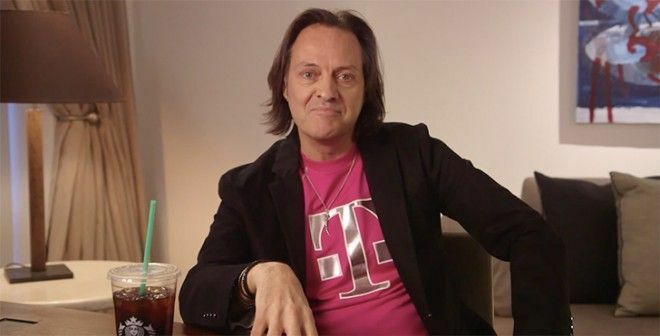 Since then, Legere and T-Mo have introduced several big Un-carrier moves that’ve resulted in similar moves adopted by T-Mobile’s rivals. Legere is also extremely public-facing, regularly interacting with customers on Twitter, Periscope, and Facebook. What do you think of this result? Do you agree that John Legere is the most powerful exec in telecom in the US? Ready for some more uncarrier moves. Not surprising. He has changed the industry for good (in benefit to the consumer). I too, am ready for some more uncarrier moves. If the network on t-mobile continues to improve, they’ll easily become the #1 carrier in the U-S of A. Hey everyone – I have Verizon here in Phoenix – I wanted to switch to T-Mobile. I pay about $140 for 30GB of data. I dont travel often but I do have Europe trip coming up and if I were to travel with Verizon it will be an additional $300 for international roaming ($10 Travel Pass a day) – can you give me your take on T-Mobile switching from Verizon? I am worried I would lose converage. Short answer is you’ll “probably” lose signal in and area you don’t need. I can speak for myself that since 2006 I have not regreted switching to T-Mobile. There are ocassions when I wish a phone or something that another carrier has. With T-Mobile you’ll gain fast speeds, great pricing, BYOD, and excellent customer service. My nephew went to school in Scotland. Had coverage through Verizon here in the US and cost was going to be very high to use verizon coverage in Scotland. He opted to get a throwaway account and cheap phone from a local provider while in scotland. Cost ended up to be about 1/3 of what verizon was going to charge. This is the best way to go, if you’re going to stay an extended period of time in a different country pick up a cheap burner phone and plan. I was surprised when, at a recent visit to the Verizon store, the Rep told me they sell over 20 hotspots per day there (no other carrier has ever come close to that figure!). He said many T-Mobile and Sprint customers get them as backups. Apparently they don’t want to pay Verizon prices full-time. I personally have 2 T-mobile phones here in Southern California, as well as an iPad Pro 9.7 on Verizon (which BTW appears to have better cellular reception than any previous iPad, and the first iPad to match cellular hotspots’ performance, in my experience). I seldom need to go to the Verizon connection (and even less often to my Sprint hotspot). I’ve had good reception and performance on T-Mobile ever since they upgraded to their ‘4G’ network years ago (before they even advertised it as 4G, even though they were generally the fasted network around). My advice is to try T-Mobile (possibly on Carier Freedom in case you don’t like it) and then get a tablet or one of the two good Verizon hotspots (the $200 models – not the cheap one) on a data-only plan later, if you find you need it. You can even do WiFi calling over the hotspot in a pinch, if necessary (probably will be rare). employee here – most countries in europe are covered under simple global, which gives you unlimited slow data and texting while abroad, and reduces the per minute charge for calls to 20 cents (we’ve upgraded data in most european countries to full-speed for the rest of this year). keep in mind, receiving a voicemail, even if not checked, is considered 1 minute. every time you cross a border, a free text will arrive to notify you of your new rates in that country. you can find a list by googling “simple global international” and choosing the first link. texting from the united states to these countries is also free, always. all of this is included on any post-paid plan you choose at no additional cost. unlimited data is $70 with easypay. do it. can you bypass the .20 cent minute calling fee by using t-mobile’s wifi calling or by using a voip app like vonage/skype using mobile data? Yes. Internet based calling is free. Wifi calling, google hangouts w/verified #, skype should all work free. I am planning on doing a lot of pictures and video uploads when I get to Europe. I see that I will only get 2G speeds, with Verizon I get LTE (if able) using my existing data bucket but I just pay $10 per 24 hours. Does T-Mobile have something similar? not sure why you would pay $10day versus getting a European sim card. I have a family of four on T-Mobile and we switched from Verizon about 12 months ago to save $100 per month.. T-MOBILE works great in major cities like NY, Chicago, Dallas, Atlanta etc.. So if you fly a lot you won’t notice a difference in fact it will be better since you get free GoGo inflight. However, if you drive between large cities a lot be prepared for long stretches of roaming or no service but mostly roaming. This usually happens when you get about 1 hour outside of major metro areas. TMO worked great in Canada this past summer and the WiFi calling feature is great. Verizon’s coverage is still the best but if you don’t need it for extended periods in remote areas then the TMO roaming should be enough. If you stay with Verizon it would be worth your time to look into Google Project FI or FreedomPop’s global SIM for cheap coverage in Europe. You’ll lose and gain coverage is certain areas. T-Mobile is in the process of rolling out band 12 LTE aka “Extended Range LTE” in the Phoenix market, so that’ll improve coverage both outdoors and indoors. Switching to T-Mobile will save you a lot money for international roaming. Coverage. SO bad on T-Mobile. My mom always say, its better to be safe (with Verizon), than sorry. Now use this power to keep Net Neutrality in place! Be the real UnCarrier by practicing what you preach and keep the internet from being sold out to the highest bidder!!!! He’s more interested in allegedly shaking things up with crap services. His bluster is wearing thin. He really needs to stop with the shenanigans and focus on a plan or 2. Not stuffing crap into different plans and putting lipstick on a pig. They are becoming like those they aspire to hate, Verizon, AT&T, etc.